1. DSR 2015 is being conducted under the same threats that were prevailing at the time of SDSR 2010 and written larger when DefenceSynergia submitted evidence to the House of Commons Defence Committee on “Towards DSR 2015” in April of this year. Since then, the global political and security context has become more acute. In having to decide how to meet the varying threat escalations, the UK government has found itself weak in being able to provide adequate military support to its declared foreign policy objectives. Whilst acknowledging that this is not unique to the UK, the shape, structure, quantity and quality of the defence infrastructure does not match the nature of the rapidly developing threats. This applies in the contexts of the UK’s alliance responsibilities and for her purely national responsibilities. It may have been essential for Defence to accept a proportion of the austerity measures introduced in 2010 but, those measures were taken in the absence of any sound strategy that took a proper account of the UK’s security. 4. This is an incredibly muddled statement to make, and a very dangerous and confusing stance for a Prime Minister to take. A defined – written – Strategy is an essential and indispensable articulation of principles that drive the pan-government activity. It is the focal point, the single point of reference, for all ministers, civil servants, and other senior figures in our government departments, for determining their departmental plans and associated resourcing and budgeting, and ensuring ‘joined up government’. Moreover, having set the strategy, the government – the Cabinet – must have something against which to measure their implementation of the strategy using Specific, Measurable, Actionable, Relevant, Timely (SMART) and verifiable metrics and data. The risk of not having a Strategy is that the roads travelled will diverge and go down their own departmental silo priorities and focus, rather than meet at the destination to achieve a coherent and coordinated government effect. To make full and proportionate contributions to those alliances that demand and seek to ensure world peace; most particularly, the UK’s seat on the Security Council must be retained and be supported by a judicious mix of hard, soft and flexible power. To maintain and, where necessary, improve the living standards of all UK’s people and make a valid contribution to the wellbeing of the underprivileged in the wider world. 6. The response to such a strategy by the Ministry of Defence could be subjective but, it behoves the planners in the MoD to consider that over recent years the steady development of NATO facing an increasingly aggressive Russian Federation has moved the crucial frontiers of western Europe so that what might be described as any “continental strategy”, in military terms, should become the primary responsibility of the eastern allies in NATO. Whether this has happened is highly questionable but to do so would achieve a more balanced set of contributions to the full operational requirement. The UK, in SDSR 2010 terms, seemed to recognise this in eschewing static ground forces in favour of restructuring towards a more nimble expeditionary force assembly. In simple terms this emphasised the need for a maritime strategy that allowed for protection of the UK’s world wide territorial responsibilities whilst at the same time making an effective yet proportionate contribution to her alliances. Sadly, the emphasis of the SDSR evaporated swiftly on the arrival of a new Secretary (Accountant) of State who failed to place the operational requirement before a proper assessment of the effect that austerity measures would have in undermining a sound defence and security policy. A further, unforgivable, risk was taken in destroying maritime air for a decade and this was compounded by gambling on an imperfect definition and implementation of “Carrier Strike”. 7. If DSR 2015 is to shape a coherent Force 2020 that will be able to contend with the foreseeable and most likely threat pattern, the MoD must be honest in assessing: “the impact on the plans for Future Force 2020 of the challenging global political and security context, including in Ukraine, the Middle East and Africa; the changing size, structures and priorities of other international forces including those of the UK’s usual allies; and decisions on Scottish independence.”. A major result of this has been a very short term perspective on the fundamental operational requirement in support of any “Grand Strategy” previously referred to. The withdrawal of troops from Afghanistan provided a justification for large reductions in Army combatant numbers without a convincing analysis of how the resulting troop formations would match Defence Planning Assumptions. In particular, where those assumptions were laid out, little consideration was given to the force enablers necessary to fulfill the aims of any campaign. 9. Major force enablers for expeditionary warfare – a National Security Strategy (NSS) imperative – would be provided by the Royal Navy and the Royal Air Force yet an astonishing decade break in maritime air capability and an impossible to justify reduction in combat aircraft types and numbers were both features of SDSR 2010. A full and detailed analysis of the UK’s Air Power assets and resources to support the DPA is at Appendix A from which the committee might wish to question MoD witnesses. DefenceSynergia do not believe that the implementation of the current plans for Future Force 2020 will provide the flexible, agile and operationally capable force required. 11. The decades since the end of WWII have been characterised by the continuous engagement of successive British governments in international affairs whilst steadily unlinking their foreign policy aspirations from the military enablers (hard power capability) required to match the policy. Since 1991 and the collapse of the Warsaw Pact the trend towards taking a ‘peace dividend’ has gathered pace with a preference for diplomatic-soft-power solutions that, in a strategic vacuum, have led to open ended commitments, with no measurability of end effect success, because hard-power enablers are under-funded and policy planning acumen is deficient. 12. Iraq x 2 , Bosnia, Kosovo, Sierra Leone, Libya, Mali, and Afghanistan are over two decades of foreign intervention operations by Her Majesty’s Forces. If these operations have a common denominator it is difficult to define except to somewhat lazily apply the term ‘counter insurgency’ (COIN) to the way they eventually panned out. Yet each operation differed in the way the UK became involved; why the UK became involved; the warning time frame; the expected and actual outcome; and under who’s auspices UK intervened in the first place. There is also a confusion as to the initial and eventual reason for intervention: national interest, United Nations Mandate, North Atlantic Treaty Organisation (NATO), European Union, or ally request? Hence commitment to operations without strategic vision, an international political and diplomatic plan supporting combat intervention, joint international understanding and an agreed ‘measurable end game’ have proved to be a recipe for mission creep, over extension, loss of public support, and unnecessary expense of lives and treasure. 13. As the British forces have not engaged alone in a major combat operation since the 1982 Falklands campaign – the last time UK had the ability to deploy its forces as an integrated war-fighting, war-winning single-force capability – it is easy to see how and why current thinking in respect of UK defence doctrine and planning are under review. However, the recent crisis in the Crimea has suddenly refocused NATO attention back onto its Eastern borders so now is probably not the time for the UK to become internationally introspective or fixated upon soft-power COIN operations to the exclusion of all else. If Russian unpredictability warns of anything, it is that peer on peer warfare may not be as remote a possibility as perhaps some analysts formerly believed. And while a major war with a peer competitor is certainly an unwelcome prospect, simply ignoring it is not the answer – only prepared, and credible, coordinated deterrence and coherent coalition action is. 14. Thus it is incumbent upon all NATO nations to reflect that COIN, in one guise or another, is here to stay – but that a peer on peer engagement is still a threat to prepare for if only to prevent a major war occurring in the first place. Perception of weakness is a variable, so, for example, NATO fire power vested in high-end technology, large mobile armies, armour, warships and jet aircraft may not impress or deter jihad fighters who may require a more nuanced and subtle approach. Hard power enablers and robust cooperative military actions, planning, and shows of strength are definitely a factor that potential peer adversaries like Mr Putin consider and are more likely to factor into their own strategy. However, as previously stated, international security and stability are not just about hard power. Military activity must be viewed as part of a coordinated and coherent ‘smart security’ strategy and approach linking political, diplomatic, economic and international development activity that identify, pressurize and engage an adversary’s ‘centres of gravity’ and pain points to instil the required end effect and desired behaviours. 15. Future UK foreign and defence policy is not therefore a zero sum game, a case of either or, but a balance to be struck between what we know and what we predict. Hence the lessons learnt in COIN operations must not be ignored and service training, equipment and culture must be adapted to allow for an effective, appropriate and measured response in the future. The UK military must have the resources, equipment and training to operate along a sliding scale of intervention from peace keeping to formation combat. If at the lower end of the spectrum this requires the formation of a unique Brigade, trained and equipped to specialise in conducting COIN operations world wide, then so be it. However, this new COIN formation must be additional, and be able to contribute, to the capacity, capability and numbers of conventional and nuclear deterrent war fighting assets that allow UK forces to be ready to deter and/or counter emerging peer level threats. Vice versa, to sustain a COIN Brigade will require roulement from the wider military units. Now is not the time for UK to withdraw from international obligations – if we do not defend ourselves who will do it for us? DS argues that the gaps in our defences are large, widening and unsustainable on land, at sea and in the air. As an example of that, it took more than 24 hours to get the only available RN vessel – a Type 45 Destroyer – from the south coast to the Moray Firth to intercept a previously undetected Russian cruiser that remained just outside the 3 mile coastal zone. How might the HoCDC considerations of Future Force 2020 be answered? “The critical mass for each arm of Service which will ensure the maintenance of an adequate intellectual, organisational and equipment base which can be expanded as needed to meet threats as they arise, as well as providing for the deployment of an effective immediate response”. 17. It is impossible to discern, from declared equipment and personnel planning, that there is any contingency in quantity, capability and numbers for expansion to meet the rise of new threats. To examine just one example in respect of readiness (there are many others). It takes over a decade, if not 20 years, to design, build, test and field a new fast jet (F-35), it takes at least 3 years to train the aircrew to combat ready status, a little less for ground crew. Time, therefore, is the crux of readiness. In the modern era the complexity of weapons platforms, the training and available industrial capacity dictate that ‘you fight with what you have on day one’ with little leeway for reinforcement (minimum buy of equipment) or battle casualty replacements (minimal Armed Forces personnel). Unless the warning time for war is in years, not months, there is simply no time to generate significant new or extra capability and capacity. And, as we never know when the clock starts to tick, whilst belligerents who set the agenda do, balanced-in-place-forces are the only guarantee of deterrence . Autocrats know this! Government hubris is transparent to a prospective enemy, who will make his own assessment of strength, and react accordingly. If UK is perceived weak, no amount of hubris-laden PM briefings will shore up the fallen wall. Si vis pacem, para bellum. 18. The nature of new threats demands a significant contingency as recent events continue to demonstrate. One might ask how well placed the armed forces are to deal with a threat to a national defence and security responsibility for an overseas territory in addition to the operations they are involved in currently. 19. Ramping down appears to be quite easy as the outcomes from SDSR 2010 demonstrated. Ramping up however is not possible in an environment where the military resources of potential threats are massively in excess of our own. The nature of threat escalation presently demands that we have to fight with what is to hand. The very philosophy within the MoD is to make savings to a minimum that they can get away with politically rather than assessing the true operational requirement demanded by the DPA. Judging by the surprise that recent Russian aggression has engendered, a dispassionate observer could be forgiven for thinking that western governments, NATO and, in particular, the UK government does not command the right integration of FCO and military intelligence amongst a host of other pointers and the judgement of individuals exercising common sense. Failure to discern threat intentions properly should have been countered as soon as the disastrous nature of the second Iraq campaign was recognised. 21. It is true to say that, in general, the United Kingdom’s education and training of those in the armed forces is towards the top of the list for rigour. Where there appears to be a weakness is in the area of preparing officers for staff appointments. This is not an overall criticism but, there is a marked and increasing tendency to focus on the process rather than achievement of optimum solutions using experience and common sense. Leadership of our fighting men is excellent but, thereafter? 22. It is early days to judge the efficacy of the government’s reserves policy but, there would seem to be a certain contradiction in the expectation that employers would feel able to make a full contribution demanded by the presumption that a reservist could immediately take on the responsibilities of a regular. It is understood that recruitment figures might be bearing this out. 23. There is a strong “whiff” that contractors have too strong an influence in shaping the equipment programme. The most striking example of this is in the acquisition of the JSF (F35B) which is an unproven aircraft with a raft of defects and deficiencies yet to be put right. Not only is this aircraft twice as expensive as those currently in the front line but, it shows little discernable improvement in operational capability over them. 24. One must believe that the role of the reserves is to complement the regular forces so that a contingency is provided for times when a ramp up in commitment becomes necessary. This indicates that education, training and exercising should mirror and, as time allows, match that of the regular forces. 25. It is not easy to “streamline” a Joint Forces Command when its constituent parts come from distinct cultures and where methods of operation have developed within single service customs and traditions. One imagines that the NATO context only amplifies the difficulties. That is not to say that it should not be done but, that the structure of any Joint Command must be sufficiently flexible to allow the best qualified people to inhabit that command and its structure for any specific campaign. The operational headquarters at Northwood provides the home for a disparate assortment of commands which offer the opportunity for operational contradictions. HoCDC might wish to be reassured that the complex of commands and the positing of their responsibilities is cohesive. The development of the contingent capacity and overall resilience to regenerate the Armed Forces and to meet future requirements. 26. As stated above, there does not appear to be any contingent capacity since the size and shape of the three services is being determined by budgetary constraints rather than operational capability. The effect of this is to pare every resource down to and below that which is a required operational minimum. For example: already there exists “gapping” and shortages in specialist categories for the Royal Navy. This is having a profound, if not immediately obvious to the Great British Public, effect on the ability of the Royal Navy to cover the broad range of responsibilities devolved to the service. The impact of the Levene Reforms on the Armed Forces, in particular, how the Joint Forces Command (JFC) will operate with the other three Services on operations and in providing contingent capability and the effect of the delegation of budgets to the three Services and JFC for equipment and other expenditure. 27. Most of this question must be answered by those in post and experiencing the planning and executing of joint operations but, it could be that the transfer of command at the outset of a campaign might provide opportunities for misunderstandings at crucial stages. In spite of the principle of budget delegations, these would appear to be controlled by the centre through those civil servants embedded at the most senior level. The costs of the reforms. 29. In the absence of a coherent “Grand Strategy”, SDSR 2010 blundered into a climate of austerity which demanded serious cost cutting and yet another overhaul of structures and procedures. The review was driven by a budgetary ceiling and some assumptions about reducing responsibilities that included a withdrawal from Afghanistan. Although the possible emergence of threats was acknowledged, they appeared to be downplayed and this has resulted in the introduction of significant risks into the UK’s overall operational capability. 30. For DSR 2015, it is not to be expected that the defence budget will be increased in any significant way and equipment programmes have been aimed at producing Future Force 2020 now six years away. In the context of the DPA, that force is flawed but, with honest consideration that mistakes have been made in suspending maritime air and mismanaging the air power components badly, corrections are still possible. 31. The DPA are in serious need of revisiting, particularly with regard to the shape and structure of the Army where a more fundamental review to confirm roles and size is considered necessary. Future Force 2020 can still be made “fit for purpose” but, the purpose(s) most be made much clearer and the fitness fully enabled. 2. This higher-level statement of national direction is required to provide the basis for formulation of national doctrine and plans, so that step-down plans for the employment of national air power resources (principally RAF) can be developed to support the Government’s strategic aims. 3. It is the DefenceSynergia (DS) view that these strategic aims and a coherent supporting narrative have yet to be fully articulated. As a result, current and future plans for the employment of UK air power risk being incoherent and uncoordinated. The net effect of this is basically confusion; specifically it highlights the mismatch between the essentially ground-centric aspirations of the National Security Strategy (NSS) and the limitations on national security imposed by the proposed air power order of battle (ORBAT). As it is currently envisaged, this ORBAT will be insufficient. Its limitations will have direct impact, by reducing the effectiveness and operational feasibility of military, naval, and diplomatic responses to any threat. 4. Therefore, this DS briefing paper is written to exam the utility of UK airpower post the Strategic Defence and Security Review of 2010 and ahead of the 2015 projections for UK forces. In so doing we find inconsistency and gaps between the funded air-power ORBAT and NSS expectations. Indeed, that the funding and balance of many defence programmes are affected, not just in UK but in the United States (US), Australia, Netherlands and Canada, by the spiralling costs of the F35 Lightning II procurement. We also note a technological change with the advent of unmanned air vehicles (UAV) but wonder if sufficient attention is being given to developing cohesive doctrine that considers the potential ethical consequences and emerging technological difficulties involved. In doing so, DS has been as objective as possible in researching this paper and based its conclusions on established air-power doctrine [ 0311 & 0433 refer to British Army established doctrine in respect of strategic narrative and air power enablers]; Defence Analytical Services Agency (DASA) data [forward available fleet]; emerging Ministry of Defence (MoD) published material; the NSS and publishedDefence Planning Assumptions (DPAs). DS research has at times been constrained by a lack of official clarity and data capture. 5. Background. SDSR 2010 and the overarching NSS set the parameters for all UK forces up to and beyond the year 2020. The generally accepted view outside of MoD is that the size, scope and capability of the UK armed forces is actually being dictated by the comprehensive spending review (CSR) process rather than any higher level strategic bench mark. Although it is fair to say that MoD made strenuous efforts within the financial constraints encountered to provide balanced capability the overall effect of SDSR 2010 was to ‘salami slice’ rather than rationalise to meet any higher level strategic assumptions. The latter not a surprise to defence analysts who generally agree that no overarching strategic narrative for the rationale and use of British armed forces has thus far been articulated by HMG. 6. The Whole Force Concept . If MoD are hampered by the lack of an articulated strategic narrative and constrained by a tight CSR it is arguable that they are being further mesmerised by ‘business speak’ in adhering to a far from clear management aspiration tool ‘The Whole Force Concept’ (WFC). Some arguing that this WFC model is simply inappropriate because it is ‘situating the appreciation’ by setting parameters for the mixbetween regulars, reserves and civilian personnel and forcing the staffs to work to an assumed ratio between regular and reserve/civilian personnel mix to meet the DPA. 8. UK Air-Power Post SDSR 2010 to 2015. Post 2015 UK air-power will be vested in a force based on E-3D (Sentry); Signals Intelligence (Rivet Joint), C17 (Globe Master), A330-200 (Voyager), A400M (Atlas), Typhoon AD/GR and Tornado GR4 (the latter with an out of service date (OSD) of 2019). The RAF and Fleet Air Arm (FAA) sharing the Short Take Off Rolling Landing (STORL) F35B (Lightning II) for operations aboard Queen Elizabeth aircraft carrier (QEC). Since 1999, RAF support helicopters (SH), elements of the FAA and Army Air Corps (AAC) consisting of Chinook, Merlin, Puma, Sea King, Lynx and Gazelle are assigned to Joint Helicopter Command (JHC). a. The RAF will have no long range maritime patrol aircraft (LRMPA) and since the demise of the Jaguar and Harrier fleets no dedicated close air support (CAS) and will have to rely upon Tornado GR4 and Typhoon FGR aircraft to support ground operations. b. The future of Sentinel ASTOR is also uncertain and although the current OSD of 2014 has been extended future funding is unclear and MoD has cancelled spending plans to upgrade RAF E3D Sentry to Block 40/45 open system architecture to meet US, French and NATO operating standards. c. The MoD plan to purchase only 48 F35B Lightning II and operate a joint RAF/FAA fleet with two main tasks – carrier and land based stealth operations – is probably unworkable with the numbers proposed. 9. The Problem Matching Available Air-Power Assets to the DPA. Whilst the DPA is reasonably specific as to the army formations and therefore numbers of personnel required in any assumed set of circumstances it is far less specific in terms of RN or RAF personnel or assets. In each declared case there is a defined army requirement – battle group, Brigade etc – but only vague references to ‘appropriate maritime and air power’. Which makes the process of determining the desired size and capability of RN/RAF air power formations required to support independent tasking or specific army operations something of a ‘finger to the wind’ staffing headache. Indeed, without clarity it is next to impossible for MoD to say whether the RN or RAF Future Force 2020 air establishments in personnel and weapons platforms meet the DPA or are simply based on the best available fix within the budget allocated. Without detailed staff work which focuses on the ‘total systems’ nature of modern air warfare linked to the actuality of the DPA all else is guesswork. 10. DS Assessment of UK Air-power Requirements to meet NSS DPA. (ASW), Airborne Early Warning and Control Systems (AWACS), Air to Air Refuelling (AAR) enabled through surface to air data linked Cooperative Engagement Capability (CEC) in an Intelligence, Surveillance, Target Acquisition and Reconnaissance (ISTAR) environment. Access, Basing and Overflight (ABO) issues. Deterrent and to engage in ASuW, ASW and coordinate long range SAR. The current mix of mis-employed fixed wing AT (lacking appropriate radar, sensors and weapons) to support surface vessels and helicopters being little more than a political fudge. d. AD assets will be required to defend UK and sovereign air space. Signals Intelligence (Sig Int), Electronic Intelligence (Elint), AAR, Air Transport (AT) and SH will be required in varying numbers to safely transport, maintain and support ground forces on non-benign air lifted expeditionary operations. f. In addition to support of expeditionary warfare operations AT will be required to routinely service and support UK overseas garrisons, roulement personnel, deliver humanitarian aid and provide casualty evacuation and aero medical (CASEVAC/AEROMED) services. 11. Unmanned Combat Air Vehicles and Drones. The advent and use of unmanned combat air vehicles (UAV/UCAV) and drones to supplement or replace manned air-power assets is a technological work in progress which does offer advantages in situations where risking the mortality or capture of the pilot/crew could adversely affect an operation. However, whilst limited numbers of various types of UAV are already operated by British forces for reconnaissance and strike the concept and future is still uncertain. Indeed, the move towards the use of UCAV as a low cost and operationally safer alternative to manned aircraft may be premature, not least because the development of artificial intelligence (AI) – essential for independent operation – is far too immature and the uninterrupted bandwidth required for full or partial remote control is far from certain or, in a cyber-warfare environment, guaranteed to be totally secure. Indeed, as control of unmanned air vehicles is often predicated upon satellite communications their vulnerability is increased if the enemy has the ability to disrupt or destroy friendly satellites. 12. UCAV Aerodynamic Constraints. A further complicating factor in the development of UCAV is that the power to weight ratio must be similar to the manned variant it is designed to replace – fuel consumption is a factor of the delivery of payload over distance as defined in the ‘Breguet Range Formula’. SDSR 2015 UK Air Power. Whilst the use of small drones (army 54 x Watchkeeper) and medium sized UCAV (RAF 10 x Reaper) is already a reality numbers in use are still low and the range, speed and payload characteristics of the current air vehicles restricts their operational effectiveness to the in-theatre tactical level – even if the data they produce can be transmitted globally. If British air-power doctrine is developing in the direction of replacing front line manned fast jets (ie Tornado, Typhoon or F35) with land or maritime based UCAV this may require far larger (heavier) airframes than currently operated and considerable further development of AI to allow the operational discernment required in modern warfare. The law of armed conflict, ethics and concepts of ‘war amongst the people’ also having to be addressed. However, if the RN are considering UCAV technology for carrier borne operations then Catapult and Arrester gear would have to be reconsidered for the QEC if the ambition is to match US concepts of UCAV operations. For example, the United States Navy (USN) X47 Unmanned Carrier-Launched Airborne Surveillance and Strike (UCLASS) aircraft which is currently being developed and tested is the size and weight of a large fast jet. The alternative is for the RN to tap into existing land based UAV ISTAR technology such as ‘Global Hawk’ and/or to accept UCAV in a limited role thereby accepting restrictions in range, payload and operational effectiveness if weather and sea state induce restrictions. 2006 to circa 155 of two types by 2020 with the FAA having some share of the proposed F35B fleet. What is missing from this picture is a Tornado GR4 replacement to meet the RAF operational requirement (OR) for a Deep Penetration Offensive Capability (DPOC), which decision, according to MoD evidence to the NAO in Apr 2013, has been deferred to 2030 and is now being designated as a Typhoon replacement. [Possible move in the direction of UCAV] The cost of the F35B Lightning II is now officially acknowledged to be circa £100m, which has necessitated the UK buy being reduced from 138 to 48 – the cost of acquiring arguably limited ‘stealth’ capability absorbing ever greater chunks of the total defence budget affecting, as Congressman Forbes says in a US context, all other programmes. SDSR 2010 and Beyond. A former Chief of the Air Staff has estimated that with the planned personnel numbers and mix of fast jets (questionably 107 RAF Typhoon and 48 RAF/FAA shared F35B) the RAF will only realistically be capable of fielding and maintaining 2 attack squadrons forward of UK main bases on enduring operations. [See UKNDA paper Funding Defence Mar 2013]. In effect this equates to circa 30 Typhoon jets for land based tasking if, as planned, the F35B Lightning II is dedicated to carrier operations. The latter, if the DPA is to be met, being 12 F35B routinely embarked on QEC with the capability to surge to 36 in an emergency – a tall order from a total fleet of only 48 airframes and not realistically achievable. This takes the total UK deployable air-power – post 2020 – to a notional 72 fast jets operating from land and sea. Albeit, in reality, this figure is likely to be closer to 36 Typhoon and 30 F35B offering a total of only 66 fast jets once training, manning and maintenance issues are taken into account. The question is: if the NSS DPA is to be met are 66 Typhoon and F35B ISTAR enabled deployable aircraft sufficient? If the answer is yes then this must be stated in the NSS, however, if the answer is no, the effect on assumed maritime, ground and air tasking must be declared – ie what can the UK not do? a. If these types of asset and their systems are so important why are the 4 RAF E-3D Sentry in the forward available fleet flying with steadily outdated communications suites, MoD having cancelled its option to buy into the US Block 40/45 ‘Project Eagle’ open system architecture upgrade programme? b. From a UK defence systems stand point why has MoD cancelled its option to upgrade the RN fleet with Cooperative Engagement Capability (CEC) – essential in air/sea battle doctrine – without which the F35B will not be able to maximise its arguably already limited defensive potential. 19. The Reality of RAF AT/AAR Capability. Therefore, although the post SDSR 2010 RAF AT/AAR force could theoretically fly 6500 troops (a single MRB) in one lift this would be without heavy equipment, transport or air-support. And although the A330-200 is reported to have a range of 8000nm, the C17 and A400M are more range limited and would probably require two refuelling stops along the same route – introducing ABO, timing and desired order of arrival (DOR) issues. Therefore, it is more likely that in a non-benign scenario that the Force Commander’s order of battle (ORBAT) and DOR will be more complex and call for a mix of air-power (including fast jets in trail and Apache helicopters in C17 loads), heavy equipment and armoured vehicles in addition to the Reaction Forces (RF). Therefore, current RAF AT/AAR ORBAT is more realistically restricted to a single air-lift of up to 3000 (under half of an MRB or 16 Air Assault Brigade (16 AAB) with its combat support). The remainder having to be air or sea lifted over a number of weeks as the first sortie aircraft return and crews and airframes are turned around and/or a maritime task force is assembled. Therefore, what MoD wishes to achieve in the DPA is governed by what can and what can not be moved by air or sea – how many, over what time frame – dictating the planning constraints for the air and sea-power aspects of the NSS and SDSR. This calculation will take into account the use of RN, Royal Fleet Auxiliary (RFA), surface vessels and aircraft taken up from trade (STUFT and ATUFT) accepting that the latter are always affected by availability, time scale and contract security considerations. The question is: does MoD have sufficient expeditionary transport enablers and air-power force protection in the RN and RAF to ensure that the ground and RM forces assigned in the NSS DPA can be safely delivered to where HMG wishes them to go in an acceptable time frame and to be able to sustain, support, reinforce, return or evacuate them if and when required? Probably not! Neither a full MRB nor 16 AAB – with all their equipment, munitions, rations and air support – could be air-lifted into theatre in under a few weeks as a cohesive battle formation. The heavier elements always having to transit by sea. requirement has been ducked by successive governments and left MoD in the position of having to shuffle ever decreasing funding between developing but still largely legacy equipped armed forces with no clear understanding of what they are being tasked to achieve, when, where and why. 21. Hence, despite the SDSR and NSS grandly discussing the character of future conflict, in the process pointing the armed forces in the direction of expeditionary maritime and air-power enabled operations – ever more reliance being placed upon data links and ISTAR capability – those very enablers are starved of funding. Whilst the NSS acknowledges that the future battle space will be more complex, especially in identifying neutrals, non-combatants and friends from foe, requiring flexibility as well as sophisticated response, the very enablers – CEC, Project Eagle, Sentinel (ASTOR), LRMPA, C4ISTAR, AAR and AT – that provide discriminating force multipliers are being neglected, cancelled, downsized or scrapped. Augmentation Force Brigades (circa 75,500 regulars)? b. Is there a full role for a 30,000 army reserve if the air (and maritime) enablers are only able to move and support so few regulars at any one time? c, In these circumstances how will MoD meet the Defence Planning Assumption: “HM Armed Forces to be capable of conducting a divisional size one-off operation of up to 30,000 personnel inclusive of ‘supporting sea and air power’ but time limited to 6 months of active operations probably in concert with allies”? d. With only 48 range, agility and payload restricted F35B how will MoD meet the requirement to defend the carrier group with only 12 routinely embarked on QEC even if the can surge to 36 in an emergency with no CEC capability? How can such a small force provide both carrier and land based stealth operations from the same establishment? e. If Tornado GR4 is no longer to be replaced (2022) to fill the RAF OR for a DPOC aircraft, is an effective combat ready deployable fleet of 30 Typhoon and 30 F35b Lightning II sufficient to meet the NSS DPA even if supplemented by UCAV? research is MoD making into retrofitting cats n traps to QEC? 1. Amidst the “hype”, euphoria and justified pride at the advent of the Royal Navy’s new aircraft carriers it is as well to inject a spot of realism over what is currently on offer as opposed to be “wished for”. Over the last few years there have been justified criticisms, about both the concept of a strike carrier, the carrier battle group, and what they will be for. Such arguments have been made by a variety of commentators; some suggest that a carrier is “all about protecting sea lanes” which is pretty disingenuous and of little help in getting an understanding about aircraft carriers and their utility. Where do these ships stand now? A combined MSC ammunition, oiler and supply ship [a dedicated carrier support one stop ship]. All USNS MCS ships [equivalent to the RFA] are now in the order of 20-25 knot vessels. 4. Since the construction of USS Carl Vinson, better radar and the introduction into the air group of specialised anti-submarine aircraft, both rotary and fixed wing, has added an A/S capability to carrier groups. This capacity has been retro-fitted to earlier ships. 7. It has become policy to give carriers only close-in short range weapons, since fitting guided weaponry takes up deck space etc, and duplicates what is available in the carrier’s escorts. If a proper air group is embarked, normal practice is to use some aircraft to carry out combat air patrols (CAP) specifically to protect the ship, in concert with airborne early warning (AEW) and surveillance, as provided in the USN by the E-2C/ Hawkeye 2000 turbo-prop aircraft and next year the E2-D, a more advanced development of this aircraft. The present version has a speed of 350 kts [cruise 256 kts], an endurance of 6 hours on task, a ferry range of 1,462 nautical miles and a ceiling of 34,700 feet. Current radar range is quoted as “over 400 nautical miles”. Should we not consider just how well the Queen Elizabeth class shapes up to what might be considered “good practice” during the course of the life of these ships? 8. Some documents suggest the range is 10,000 nm at 15 kts; however journalists were briefed before the naming ceremony that the ship could “cover 500 nm per day”. This equates to all intents and purposes to 21 kts, so perhaps this is her economical speed. Officially it is stated that a CVF will have the ability to self-support for 7 days between replenishments. It does not however explain how this figure is calculated, as surely it will depend on flying operations, weather conditions, etc, etc. Fuel capacity (the figure is not divided between MDO and aviation fuel) is given as 8,600 tonnes. Here we have an example of lack of forward thinking, considering the proposed 50 year service life of the class. If the ship was nuclear powered/steam turbine driven, all the fuel capacity could have been given over to aviation fuel. UK strike carriers of the 60s/70s. 9. By contrast, HM Ships Eagle and Ark Royal IV were Audacious class ships of circa 50,000 ton full load. Machinery was pre the Y-100 family of designs generating SHP 152,000 ≣ 31.5 kts. FFO capacity was 5,500 tons. 10. HMS Victorious was re-boilered during her re-build and despite the fact that she was now 35,500 tons full load, newer HP boilers enabled her to still make over 30 knots. 11. 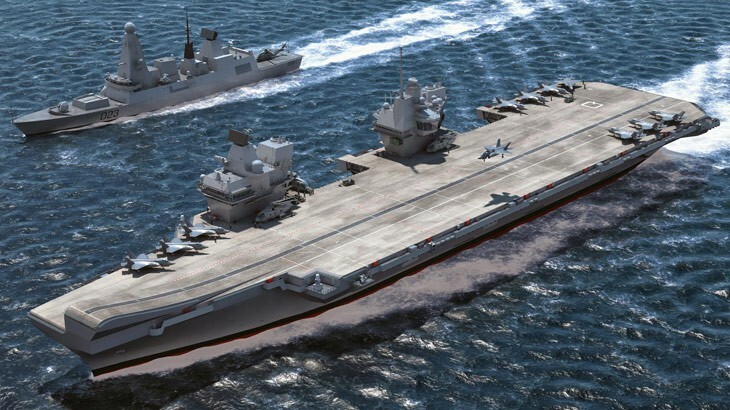 The decision to build two strike carriers was taken during SDR 1998, however it was to be after a decade of design studies that the contract was signed on board HMS Ark Royal on the 3rd of July 2008 between the Government and the Aircraft Carrier Alliance, an industrial consortium comprising of the then BAE/BVT JV, Babcock Marine, Thales UK and the MoD. Whether or not the MoD, factually the customer, should have been included in the organisation is a matter of some conjecture, but that, nevertheless, is how it stood. 12. Within the design period and as stated by the Platform Design Director (PDF), two other vessel sizes were contemplated. One was larger [circa 80,000 tonnes] and deemed to be too expensive, the other was smaller, probably around the size of the current USS America. The finalised design for the CVF was commenced around 2005 to what was admitted to be a tight budget. As a result, one of the first things to go was nuclear power. The PDF goes on to state: “This is a brand-new ship, so getting through all the safety aspects of nuclear power would have been hideously expensive.” Instead, as is the case with the Type 45, a power station type installation comprising of two Rolls Royce MT30 gas turbine generators (on sponsons at deck level 04) and four diesel generators deep inside the hull provide power for full and cruising speed through electric motors driving two shafts. Designed top speed is around 25 knots. 13. USS Enterprise (1961) was the first nuclear big deck carrier, similar in many respects to the one class steam turbine conventional carries USS Kitty Hawk and USS John F Kennedy. Enterprise was able to carry 50% more aviation fuel than the former ships, despite having 8 reactors, which took up a lot of space. The USS Nimitz (1968), having new compact reactors (2 in number), embarked 50% more ordnance and 90% more aviation fuel than the conventional ships, had available 260,000 SHP (190 MW) and a speed in excess of 30 Knots, equivalent to 720 nautical miles daily, 120 miles more than the QE class. Furthermore, a period of 20 years (at time of construction) would pass before the need for a refuelling refit, in other words, again at time of build, almost half her anticipated service life. 14. It is difficult to square PDF’s statement on “hideous expense” with all the experience the UK holds through nuclear submarine ownership and the blueprint that the USN holds for their carriers. Going for nuclear power would have eliminated, directly and indirectly, a number of serious shortcomings in these ships. It can probably be argued that through life costs would come down as a result. 15. In the current configuration, which one guesses we are stuck with, I’m afraid the hot areas caused by the two funnels are something the RN will have to live with. 16. Money has also been saved by deleting side armour protection, although the PDF insists “this was a strategic rather than a budgetary issue.” He adds that “The CVFs first line of defence is the frigates and the new Type 45 destroyers around us” and that “our only self-defence is close-in weapons systems and small guns. Instead what you have on the ship is 36 of the most lethal aircraft ever made.”. No mention is made of AEW or combat air patrols, of which, more later. 17. Having seen first-hand the punishment RN carriers could withstand during the Pacific campaign in WW II, the United States was swift to adopt armoured flight decks and hangars. The current situation is that 2.5 inches of Kevlar armour protects vital areas, and flight deck ballistic protection is achieved by using high strength low alloy steel for construction [from USS John C Stennis onwards during build, and upgraded in earlier ships during upgrade refits]. 18. One would have thought the MoD would have thought it prudent to follow suit. 19. It has been stated officially that the Sea King ASaC.7 airborne surveillance and control helicopters will now be retained until 2018 [perhaps in time for QEs first of class trials with the F-35B. It is accepted that the system started [as a result of Operation Corporate] as an open ocean AEW asset, but that it is now more generally assessed as an aircraft for the collection of expeditionary intelligence, surveillance, target acquisition and reconnaissance, hence its use in Afghanistan and Libya. Work commenced late last year on its successor, known as Crowsnest, to provide a roll-on/roll-off fit for the RN’s Merlin Mk 2. As both Lockheed Martin and Thales are bidding, it would be speculative to attempt to offer any operational parameters, however it cannot possibly compare with those of the E2D outlined above. It is planned to have a 2020 ISD, with initial operational capability in 2021, and full operational capability in 2022. The system is supposed to be a key element of carrier strike but, like the F-35B, it has yet to be seen as effective or operationally sound. 20. It seems odd that with our history of successful strike carrier operations, the RN would choose VSTOL, particularly on such a large hull. (HMS Ark Royal IV 50,786 tons full load 219.5m 257.6m oa x 51.2m (flight deck) x 11.0m as against QE 70,000? Tonnes full load 284m x 73m (flight deck) x 11.0m). Although no definitive requirement was made regarding the ability to retro-fit, the following statements were made at the times indicated. “The design of the two vessels is, however, optimised for operation of the Short Take-Off and Vertical Landing [STOVL] variant of the Joint Strike Fighter [JSF]. The first such development aircraft completed its maiden flight in June 2008, and flight testing is going well. The carrier can also embark helicopters, and the adaptable design is future-proofed to operate unmanned aerial vehicles [UAVs]. It goes on to state, importantly as recent developments have shown, that: CVF’s innovative design also means that, should a more conventional aircraft be chosen at a later stage, the deck can be reconfigured with catapults and arrester-gear installations”. 22. It should be noted that the original ISDs had, by the end of 2008, been altered to 2015 (soon to slip to 2016) for QE, and 2018 for PoW, thus beginning the delays for short term budgetary reasons, which have, inevitably, led to the increases in cost to date of both ships. The NAO (Major Projects Report 2013) notes that the cost increase to date is £754m and, adding in a recent additional 5 month delay, the total is a 29 month delay all told. 23. From the Commons Defence Committee Report on Defence Equipment [Spring of 2009]. 24. Dr. Andrew Tyler [then Chief Operating Officer at DE&S] said that space underneath the flight deck had been left in order that, should you wish to do so in the future, one could fit catapults and traps which sit immediately under the flight deck. This would enable the MoD to change the carrier over to a conventional take-off capability. 25. Later in its deliberations, the Committee asked whether the MoD would consider buying a non-STOVL version of the JSF if the STOVL version was not available. Rear Admiral Lambert confirmed the MoD is proceeding with the STOVL version. CDM [Chief of Defence Materiel] said that the carriers could be fitted for the carrier variant of JSF if the STOVL variant did not proceed. 26. If we accept the “innovative design” and other various words of wisdom on the relative ease with which the ships could be modified, it raises awkward questions about how, after the U-turn from Variant C back to Variant B of the F-35, it is possible for the cost of fitting EMALS and arrester wires to rise from £920m through £950m to £2bn, over double the original estimate? And perhaps to put it in context, the cost would almost build two Astute class SSNs. Are we to believe that building two highly complex submarines would be comparable to fitting cats and traps to two carriers, one of which is not even as yet being assembled? 27. It is also worth noting that the third planned ship was for the French Navy, and it was always going to be conventionally configured. This surely suggests that the design, as often stated, was flexible enough to adapt to the installation of cats and traps. 28. Failure to recognise the realities of strike carrier posture and equipment means that the RN will have to exist without proper turbo-prop mounted AEW, will have no electronic suppression aircraft or, apparently, the ability to carry out in-flight refuelling, will have to rely on rolling landings (something which no other user of VSTOL aircraft conducts), will not be able to cross operate aircraft with allies and probably, most importantly, will be unable to launch and recover large unmanned aircraft such as the X-47B, which has, already, launched and recovered successfully in trials with USS George H W Bush last year in the Atlantic. Shipboard rolling vertical landing (SRVL). 29. Readers will be aware that there has been concern for years that the F-35B will be able to meet Key User Requirement 4 (KUR 4), which sets out a vertical recovery threshold. The United Kingdom requirement, which is more stringent than that of the USMC, requires a recovery on a hot day (34°C) with a payload of just over 4,000lb, effectively 2 AIM-120 missiles, 2 precision guided bombs and a fuel reserve. In 2008, the then predictions suggested a shortfall of circa 175 lbs. Resulting from this, the MoD began exploring a third way, that being the adoption of a “running landing”. This would exploit the ability of the aircraft to use vectored thrust to slow the speed of its approach to about 35 kts of closure relative to the carrier (assuming an airspeed of 60 kts and 25 kt wind over the deck) while still gaining the benefit of wingborne lift. It was thought that this offered the possibility of a significant increase in bring back weight, compared to vertical recovery (estimated at over 2,000 lb). Rolling recovery would also reduce propulsion system stress to increase operational flexibility and propulsion system life. A decision was therefore made in 2008 to include SRVL in the development of what was then known as the JCA (F-35 family, now Lightning II). 30. Tests and simulations pointed towards a system of Visual Landing Aids [VLAs], and led to the development of what is known as the Bedford Array. As part of the work [land based flight trials and the already mentioned simulator trials] QinetiQ was contracted in 2007 to use its Harrier T4 Vectored-thrust Advanced Aircraft Control [VAAC] test-bed to perform representative land-based trials [it could mimic the characteristics of the F-35B] and a ship-based SRVL demonstration. These were conducted in FS Charles de Gaulle in the summer of 2007, when 18 approaches were made to CdG, and these events showed that SRVL was a safe recovery method to a carrier at sea in sea state 6 in daylight, visual conditions. 31. Visual Landing Aids trials using the Bedford Array were conducted using the VAAC Harrier making approaches to HMS Illustrious, to which the array was fitted to the port catwalk of the ship, with the aircraft making representative approaches, rather than actual landings. These could not be performed, owing to the limitations imposed by flight deck dimensions in the Invincible class. The trials were carried out in November 2008, down to a safety height of circa 40 feet, thus evaluating the system’s ability to indicate, accurately, a SRVL glide slope aim point. Full confirmation of these assumptions will, of course, only be possible after first of class flying trials. Carrier On-board Delivery (COD) aircraft. 32. Like all sophisticated weapons platforms, aircraft carriers often need to be resupplied with personnel and/or urgent spare parts for either the ship or its aircraft. When far out to sea away from home base, such resupply needs to be conducted by specialist fixed wing aircraft that require the cat and trap facility. CTOL Unmanned Air Vehicle (UAV) aircraft. 33. Specialist UAVs with very long range and endurance will soon be available for operation from aircraft carriers. These are similar in size and weight to manned fighter aircraft and will certainly require arrestor gear for recovery on board. The design being proven by the U.S. Navy also relies on catapult launch. 34. Such UAVs will provide a very cost-effective Deep Strike capability and Long Range Surveillance capability – but not from a ramp-fitted flight deck. 35. All United States Navy strike carriers embark specialist, highly sophisticated Defence Suppression Aircraft. The A/E-18 Super Growler is now the aircraft of choice and demonstrated its prowess/effectiveness so impressively in Libya. U.S. Navy strike aircraft (including future F-35 assets) will not be tasked against any modern air defence infrastructure without the support of the Super Growler. This prevents attrition of own forces. 36. This vital Defence Suppression capability cannot be part of the air group in a ramp-fitted carrier. This important issue was not brought to the notice of the Secretary of State and his Cabinet colleagues. The original question of flight deck armour. 37. This resulted from indications that the flight deck of USS Wasp was initially damaged by heat from F-35B jet efflux during preliminary landing trials two years ago. Further questions regarding the QE class deck have been raised, and it was thought that if it required to be strengthened/armoured, what would the result be on stability, would the structure be strong enough, bearing in mind a 50 year life span, etc, etc. 38. It is undoubtedly a calculated risk to do without it. Apparently the design should have incorporated armoured hangar doors/bulkheads, and it is now being reported that they were omitted on the grounds of cost. 39. Naval architects who did not have access to detailed hull and shell plating drawings, found it difficult to give a definitive answer. Needless to say, if hundreds of tons of additional steel are added at deck 09 height, it is going to affect ship stability considerably and added compensation [perhaps solid ballast] would need to be added, thus creating possible draught problems at both home port and at Rosyth, assuming the ships will refit there. Reworking the flight deck with a different grade of steel would not be a viable proposition, in QE in particular, given that she is now structurally complete. 40. This two island configuration, part again of the oft quoted “innovative design”, is, necessary because of the location of the various generators’ exhaust trunkings. It is understood, mainly from USN experience, that the more deck houses etc on a carrier, the more wind eddies were generated, and that this should be avoided. In the later Nimitz class, we see reduced island size, and siting further aft. This gives a better view of the deck, gives more space for parking and marshalling and, by making the structure smaller [Gerald R Ford’s island weighs 550mt] reduces the radar signature. USS George H W Bush, as the interim lead in to the new class, shows the difference from earlier ships clearly. RFA URG [underway replenishment group] support. 41. This seems to have been given little thought although it will be claimed that the liquid fuels issue is being addressed by the construction of the new Tide class fleet tankers. One might find it difficult to support this view for a number of reasons. 42. If we look at possible scenarios, it may well be that the carrier will want to be poised off shore for whatever reason in a suddenly developing situation far from home. The difference between the daily transit at full speed between US and RN carriers has already been noted as being 120 miles per day. If the ship only requires to move, say, 2000 nm it does not really matter, but let’s say we are looking at many thousands of miles [a crisis in the Gulf, and the Suez Canal has been closed, for example], it suddenly very much matters. Say 8,000nm distant: At 25 knots is 13 days and 8 hours; at 30 knots it is just over 11 days. These days might just be crucial. 43. By the time the carriers are in service, the RFA tanker fleet will comprise of 2 Wave class fleet tankers [31,500 tonnes; 18 knots] and 4 new Tide class tankers [37,000 tonnes; 15 knots]. Solid support [victuals, stores, munitions and air stores] will remain vested in Fort Victoria [a one stop ship caring armament, fuel and spares, 35,000 tonnes; 20 knots] and the two early Fort class dating from 1978/79 [ammunition, food, stores, etc, 22,890 tonnes; 20+ knots]. These three ships are eventually to be replaced [circa 2022?] by 3 solid support ships of circa 44,000 tonnes. 45. Finally, the paucity of ideas within the MoD is illustrated by the disposal of RFA Fort George, since she was, originally, Ark Royal’s dedicated support ship. This relatively young hull could have been converted to an air stores and aircraft ordnance support vessel, which could, in addition, carry victualing stores. Joined up thinking or forward planning? Not a chance! As a “replenishment aside” it is worth noting that no helicopter within the MoD inventory can lift a complete F-35B engine unit. 46. The many shortcomings of the F35B have been highlighted elsewhere but, as we await an indication of procurement numbers for the first batch of UK aircraft, it is as well that an understanding of the aircraft software issues is laid out, as it applies to all three variants. 47. In the spring, this was highlighted in a report by the US Directorate of Operational Test and Evaluation, DOT&E, which oversees the progress of the aircraft towards true operational capability. The USMC [and this is crucial to the UK] hopes to achieve what the Americans term Initial Operating Capability (IOC) with the F-35B in December 2015, the unit being VMFA-121 based at Yuma Marine Corps Air Station. The hoped for capability will allow 6 aircraft to operate under “austere conditions” with the current basic software known as Block 2B. It is important to understand the limitations here; Block 2B allows the aircraft to be flown, and to fire weapons and drop ordnance. It does not, however, offer either full sensor interaction, or full combat capability. The three UK development aircraft flying in the States are using this particular version of F-35 software. Apparently the DOT&E considers that the software is unlikely to be mature until 2016. 48. The USAF hopes to have the F-35A operational in December 2016 with what is termed Block 3i software. This is identified as Block 2B reworked in more powerful computers, whilst the Navy, which apparently places a lower priority upon the entry of the Lightning II into service, is looking at February 2019 with Block 3F software. This will again be a leap forward, giving a much greater operational capability, but nonetheless, it will still require several years of tests and development to reach maturity. It is therefore obvious that aircraft built before the inception of Block 3F will need to be upgraded, and this will affect UK purchases, at least of the initial tranche of aircraft. 49. DOT&E have in the same report expressed continuing concern about the progress of the Autonomous Logistics Information System [ALIS] which is described as “immature and behind schedule.” As has been discussed before by many experts, this is of enormous concern, because it represents the heart of the F-35 family’s ability not only in operations, but in maintenance and supply chain management. The aircraft literally cannot function without it, and the Marine Corps has expressed deep reservations about the lack of field ALIS to support operations away from the main base, i.e., from USS America, for example. This has obvious implications for the RN carriers, as ALIS must be in place in the UK and on board the carriers before the F-35Bs can operate outside the United States. 51. The F-35B survivability relies very heavily upon its stealth capability against enemy radars, from both fighter intercept and wide area search types such as AWACS equivalents or land/sea based. This comes at a considerable weight penalty to the aircraft as a result of airframe shaping beyond the aerodynamic need. This adds otherwise unnecessary structure as well as other materials being fitted within the airframe that are designed to absorb radar energy. 52. The way this works systematically is that a conventional radar fires its energy at the F-35B which, with its special airframe shaping, deflects the energy away from the radar’s receiver in a harmless direction. The remaining energy not deflected is then very substantially absorbed by the ‘lossy’ material. All that is left is a tiny bird or ping-pong ball sized energy reflection which most radars will not be able to detect. 53. However, the entire concept has a major flaw. Most people think of radars as ‘mono-static’ where the transmitter and receiver are in the same place – using the same antenna. But there are systems called ‘bistatic’ radars where the transmitter and receiver may be separated by tens or hundreds of miles. Unfortunately for the F-35B, its ability to deflect radar energy away from a mono-static system into apparently harmless free space fails with the bistatic model, because the aircraft may in fact be deflecting the energy in the direction of the bistatic receiver. 54. This is not a new, radical capability; bistatic systems have been around since the earliest days of radar – such as UK’s own Chain Home. More recently in the late 1980s and early 1990s advanced bistatic techniques were reported by Gaspare Galati in his excellent book ‘Advanced Radar Systems and Techniques’ in the chapter by Mr M R B Dunsmore of UK’s Royal Signals and Radar Establishment. The conclusion drawn was that stealth shaping helps bistatic detection capability to the point where the utility of stealth is reduced to almost nil. 55. That, in spite of the Royal Navy having significant historical experience of Strike Carrier design and operations coupled to the current United States Navy’s experience of the foremost operator of this type of ship, the Queen Elizabeth class, in spite of its “up to date” equipment, is seriously constrained operationally and very vulnerable to emerging threats. These deficiencies have been foreseen and warned about but, like ‘dinosaurs” of old, those with the ability and capacity to right the wrongs have failed so to do. To all but those having to fight these aircraft carriers they will be wondrous things; Government, The Joint Command, Royal Naval Commanders and the ships’ companies will find their operational capabilities frustratingly limited. 56. It behoves the Ministry of Defence to revisit the QE class aircraft carrier procurement programme in order to achieve true Strike Carrier operational capability.